Declawing kittens or adult cats requires the removal of the claw. Because the claw is permanently affixed to a cat's knuckle, this also means removing all of the third bone from a cat's paw. Laser Declawing: A laser is used to remove the third bone of the cat's paw. Laser declawing is usually more expensive than blade declawing, but laser declawing results in less bleeding during surgery, as well as less pain and shorter recovery time. This is the ONLY way we will perform the procedure. After surgery, your cat will be given a long acting antibiotic injection as well as the best pain medications avaialble in order to ensure that infection and pain are a non factor. We will keep your furry friend overnight to ensure that they are comfortable, and even though uncommon, that there is no excess bleeding. You will have additional pain medications to give once they go home. Complications are rare with the laser, but if at any point if your cat begins to limp or favor their paws, please call us as soon as possible. 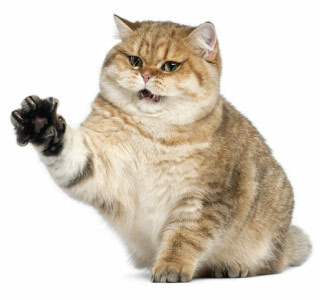 At Carson Veterinary Clinic, our veterinary team has provided education and insight to help many concerned and caring cat owners decide if declawing a cat is the right decision to make. If you are looking into cat declawing surgery, or have any questions about declawing cats, please contact us to schedule an appointment with a member of our veterinary team today.